With only 9 days until the opening of the 2008 Walters Prize it’s a busy time at the gallery with work being shipped in and installed, and exhibition spaces being transformed. Our team of preparators work very hard to ensure that in the short turn around time between exhibitions, everything runs as smoothly as it can. I thought I would give you a behind-the-scenes view of what it is like while this is all going on, starting with John Reynolds, one of the four 2008 Walters Prize finalists, and the installation of his work Cloud. 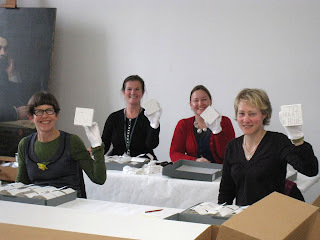 Cloud consists of over 7000 (yes that’s not a typo) small paintings, all individually packaged in numerous boxes, carefully sent from Museum of New Zealand Te Papa Tongarewa who own the work. The conservation team (the happy bunch in the image below) have prepared condition reports on each painting individually to make sure no damage occurred in transit. They have been a very busy bunch. "With over 7000 pieces and after 156 hours, 4 conservators, 3 volunteers, the artist, his assistant and 2 gallery guides, this artwork is going on the wall and finally taking shape. It looks fabulous!" As the work is so large it expands from the ground floor up over to the second floor of the New Gallery. This has involved putting scaffolding up in the gallery. Finally, here is John Reynolds himself working on the installation of his work. Its really interesting being able to see the installation of the works for the Walters prize. Thanks, great to get some feedback wish i was a star. 1 Day to go - did we remember everything? On Photography - What is an ambrotype?